Damn! I was in Athens when this was going on! 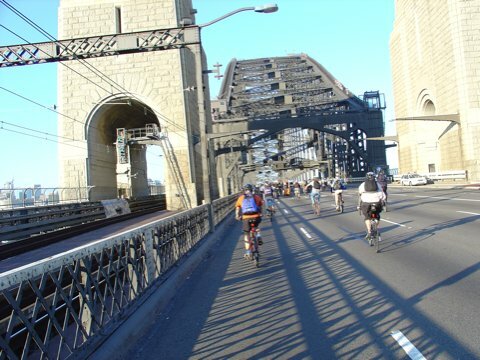 The bridge ride is good fun though, really worth hearing the taxi drivers swearing at the cyclists as we were riding through in the 2003 ride. Damos says hi and he seems keen to get into blogging himself. Even more historical is the fact that it was one of the few days that Adrian could get his arse in gear and cycle to work! This pic would be great for a story I’m putting up on The Wheeler website. Mind if I use it? You can use the picture as long as it links back to my site.